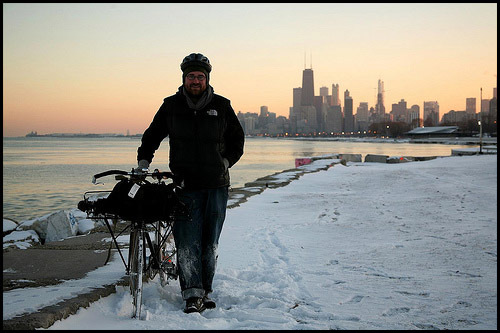 Fly fisher and pro photographer Rick Gersback uses his specially-made bike -- designed by Winter Bicycles' Eric Estlund -- to haul his gear all year round in his native Chicago. 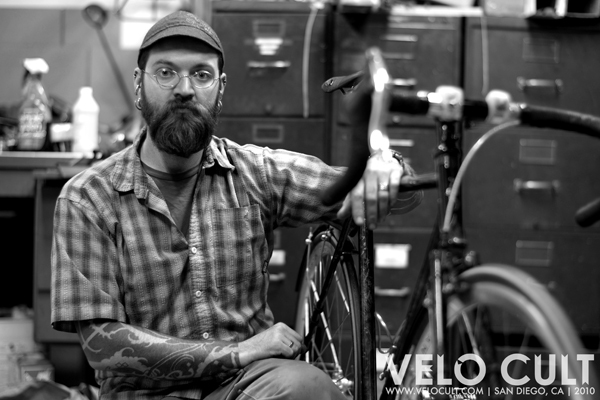 Eric Estlund tackles every winter on two wheels: he’s the owner of custom bike shop Winter Bicycles in Eugene, Oregon, where the season is relatively mild but extremely icy. He's also clocked plenty of hours on wet Seattle and cold and snowy (and Toronto-like) roads in Salt Lake City and New Hampshire. As Torontonian cyclists braved the first blanket of snow over the holidays, dandyhorse senior editor Dana Lacey sat down with the bespoke bike builder in search of tips for conquering the season in style (and with minimal wipeouts). We’re publishing the interview this week in two parts. First up: How to choose a winter-friendly bicycle. (Coming up later this week: Winterizing your ride and your wardrobe.) All the bikes pictured are rides Eric built. dandyhorse: Why bike in the winter? Eric: Riding in the crisp air when other folks are heading in can be a great experience -- it doesn’t need to feel like punishment. Winter cycling retains all the utility of fair weather cycling, and with a bit of preparation and a few gear upgrades, it can be comfortable and safe. The name “Winter Bicycles” actually comes from this idea -- we build bikes that can work all year round and encourage people to not think of an “off season” from cycling. But don’t feel like it has to be all or nothing -- if it’s just too nasty out don’t be afraid to walk or bus for the day. When designing a bike for winter use, what features do you consider? When I’m designing a bike for year round use, I generally focus on the integration of a few specific systems -- room for appropriate tires, solid brakes, fender clearance (with room to pass road gunk) and lighting. When I’m building for a client I can design these elements to work seamlessly together to meet a rider’s specific needs. These features are equally important as part of an integrated custom bike as they are when retrofitting your existing machine. While just about any bike can be pressed into service [for winter riding], I generally recommend something other than a strict sport road bike. 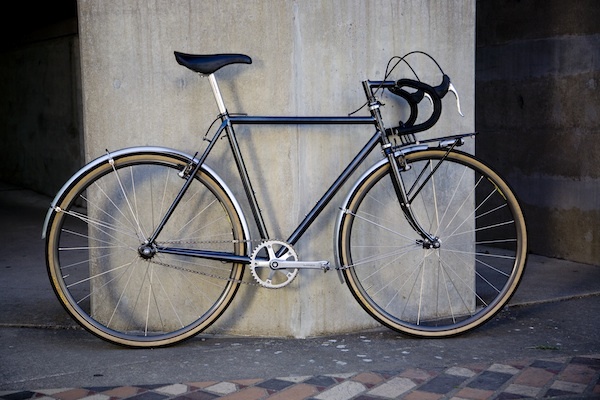 For a winter specific set up, I really like fixed gear and internally geared bikes. The reduction in cables and external shifting components simplifies maintenance and helps keep snow and slush buildup to a minimum. The bike pictured above is the first one I did with my bilaminate head tube. 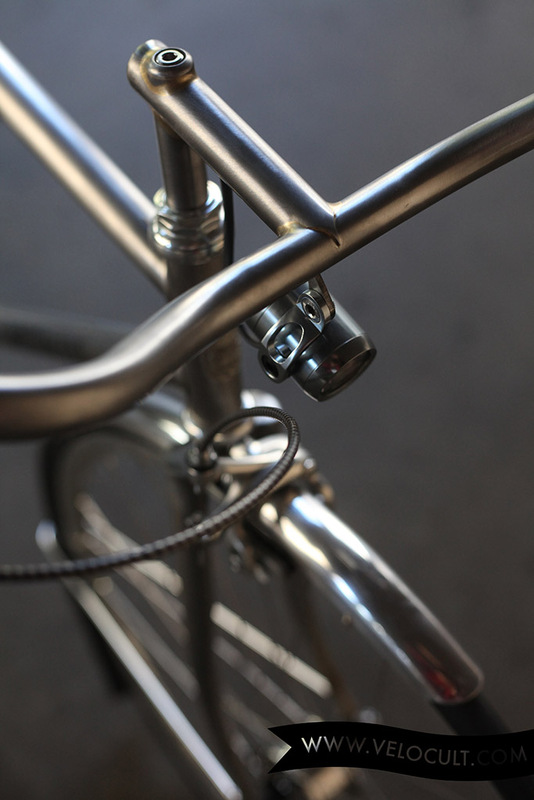 It is a single/ fixed rando bike with a medium porteur style rack. Tires are going to vary a bit based on the specific riding conditions, but generally speaking a modest width touring tire with a little lower pressure and a good puncture resistant belt is a safe bet. These tires balance good road grip with the ability to corner in slush. Mountain bike and cross tires can work well in snow, but if they pick up slush the tread can pack tight making them very slick. Similarly, studded tires can provide excellent grip on ice, but are slick on hard pavement. For the casual rider I recommend picking the tire suited for the conditions you are realistically going to ride in. For the more committed daily cyclist, it may make sense to have a couple of sets you can swap based on the day. A woman's cross race bike with mini V brakes (with internal routing). Photo by Tina Buescher. Solid brakes are going to make stopping and modulating speed more precise. Disc brakes are great all-weather stoppers, and generally handle snow and ice well (Plus you don’t get any rim wear from road grime). Good rim brakes also work very well, and are less likely to freeze solid if you have to leave your bike outside. I recommend wet weather brake pads and a professional adjustment. Full coverage fenders keep the road grime off of you, but they also help keep it off the mechanical parts of your bike. Make sure there is enough room for some snow build up -- I usually shoot for 10-15mm of clearance between the tires and fenders. If your bike won’t accept full coverage fenders (most will with a little creativity) then the varicose clip-on type will still be helpful in keeping you dry and comfortable. 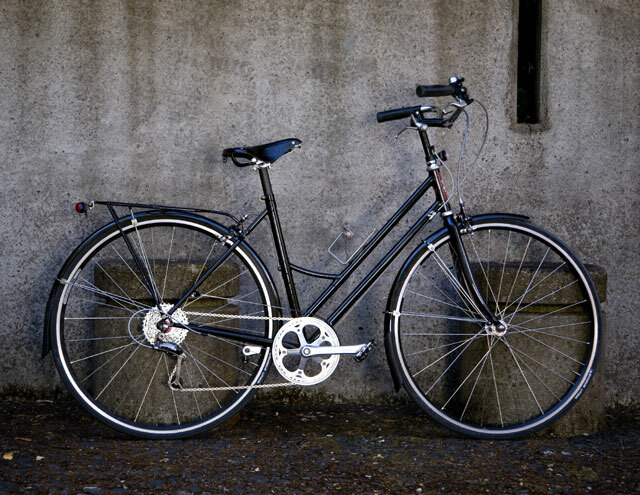 Pictured: This city bike combines the position and good looks of an English step through with the handling and performance of a modern race bike. This bike was built for a woman that loved her road race bike, but couldn't ride with weight on her hands post surgery. Good lighting, front and rear, is essential to safe winter riding. Be it a gray day or just a shorter sunlight period, good lights help you see and be seen. I am a big fan of dynamo hub-based systems: they are proven in all weather conditions, provide ample light (especially when teamed with the newer LED lamps) and don’t have batteries to go dead or freeze. They can also be integrated into the design of the bike providing for a very clean set up (the stainless steel bike pictured above includes a Supernova E3 light. 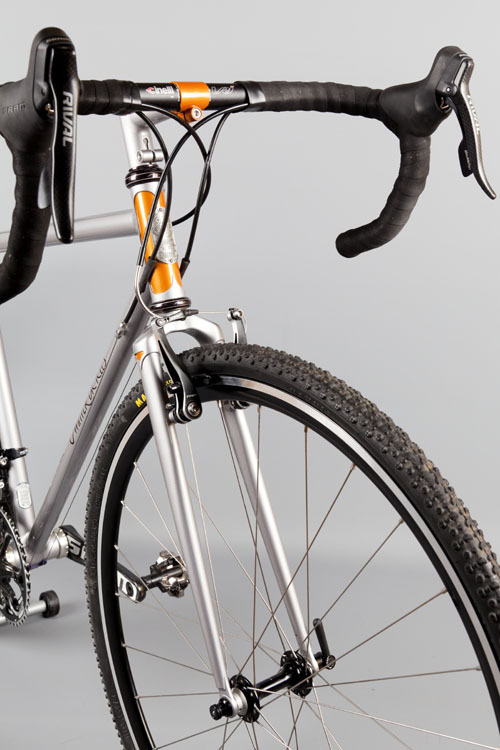 The system is internally wired through the fork, steering column and stem for a clean and low maintenance look). If you are opting for battery-powered lights I recommend the best you can afford. I generally recommend against the “blinky” class of lights -- for only a little more money one can purchase something with much better safety and utility. Don’t forget your tail light, and don’t skimp, either. In heavy rain, fog or just generally dark winter days, a bright tail light will make you visible to other road users.